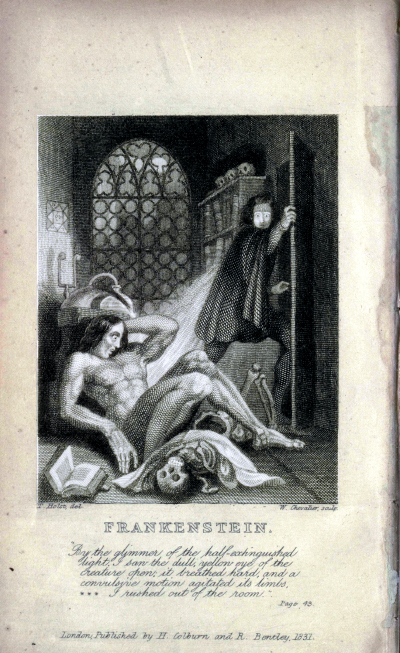 Inside cover art from the 1831 edition of Frankenstein. With its themes of scientific ambition—and the moral questions it raises about scientific progress—Frankenstein is a quintessentially Caltech novel, says Kevin Gilmartin, dean of undergraduate students and professor of English. To mark the 200th anniversary of Mary Shelley’s novel, Gilmartin joined scholars from the Keats-Shelley Association and the Byron Society of America in organizing “Frankenstein Then and Now, 1818-2018,” a two-day conference held in May at The Huntington Library, Art Collections and Botanical Gardens. Supported in part by the Division of the Humanities and Social Sciences’ Anne Rothenberg Fund for the Humanities, the conference explored Frankenstein’s enduring influence on art and culture. Promotional photo of Boris Karloff from The Bride of Frankenstein. Mary Godwin Shelley, the daughter of feminist writer Mary Wollstonecraft and philosopher William Godwin, began writing Frankenstein in 1816, when she was 18 years old. She and her future husband, the poet Percy Bysshe Shelley were visiting Lord Byron at his villa on Lake Geneva in Switzerland. When bad weather forced the party indoors, Byron proposed they each write a ghost story. Frankenstein was Mary’s submission. The first edition of the novel was published anonymously. Shelley’s name was added to the second edition of the book, published in 1831, after she had revised it. While the novel has inspired dozens of film adaptations, it is 1931’s Frankenstein, directed by James Whale, that is responsible for perhaps the most abiding image of Frankenstein’s monster: a square-headed creature with heavy eyelids and bolts in his neck. The full title of Shelley’s work is Frankenstein; or, The Modern Prometheus, and it is widely considered to be the first science fiction novel. The Huntington holds a significant collection of materials related to Mary and Percy Shelley, including notebooks and letters.